For today’s deals, we have an LED monitor, a couple of Bluetooth speakers from Samsung, some smartphones and more. Picking the best deals from the plethora of offers is no small task but we have compiled a list of top deals which will save you some bills. 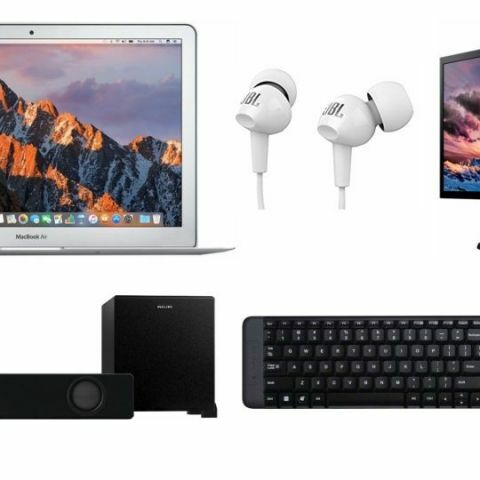 Today we have found good deals and discounts being offered on the MacBook Air, sound devices like headphones, smartphones, speakers and soundbar, and many more gadgets. So let’s take a look. The Philips Bluetooth soundbar has a power output of 40W and comes with an external subwoofer which has a max power output of 18W. The device sports a 2.1 configuration and an aux input for connectivity. You can buy it here. The Apple MacBook Air 2017 is powered by the Intel Core i5 processor with 8GB RAM and 128GB SSD. It features a 13.3-inch screen and comes integrated with Intel HD 6000 graphics. You can buy the laptop here. The smartphone has received a 50 percent discount and is also available on a no-cost EMI starting at Rs 2,555 per month. Customers can also get Rs 18,000 off on exchange. You can buy it here. The smartphone features a 5.5-inch full HD display and comes with a 13MP rear camera and an 8MP front-facing camera. It is powered by the company’s own Exynos 7870 SoC which is paired with 3GB RAM and 64GB ROM. You can buy the smartphone here. The smartphone is equipped with the Exynos 7870 SoC and 3GB RAM with 32GB internal storage. It features a 5.5-inch full HD display and comes with a 13MP sensor for both the front and rear cameras. You can buy the smartphone here. The wireless keyboard mouse combo comes with a USB 2.0 wireless adapter which is used to connect to a system. You can buy the device here. The headphones come with JBL sound signature and feature one button with a mic. The device features 9mm drivers and comes with 3 ear tips of varying sizes. You can buy the in-ear headphones here. The speaker comes with Bluetooth connectivity but doesn’t come with an onboard battery, thus drawing power via a USB cable. It boasts of 2.0 channel sound and can be used with a laptop, smartphone or any other device with Bluetooth. You can buy it here.